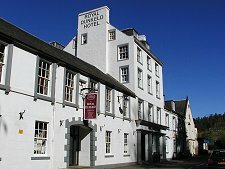 The name Dunkeld comes from the Gaelic for "the fort in the wood". Its recorded history dates back to the foundation here of a settlement by Culdee Monks in about 730AD. This was rebuilt by Kenneth MacAlpin in 848 and two years later Dunkeld became the religious centre of Scotland when St Columba's relics were moved here from Iona for safe keeping from increasing Viking raids. 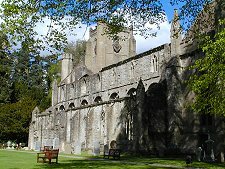 Dunkeld's fortunes up to 1560 were closely linked with those of the Cathedral it served: so the destruction wrought by the Reformation that year was a huge setback for the village as well. It also robbed the village of a bridge over the River Tay, planned at the time, following years of promises by the Bishops. After the Reformation the village's story is distinct from that of the Cathedral, part of which was reused as the parish church. Scotland's first brick house, Dunkeld House, was built here in 1680; and a post office opened in the village in 1689. However, little of what you see today in Dunkeld is earlier than 1689. The accession of William and Mary to the throne of Scotland in March 1689 (see our Historical Timeline) was followed in July by the first of a series of Jacobite uprisings. The Jacobites defeated Government forces at Killiecrankie, a few miles north of Dunkeld, in July: though with the loss of their leader, Viscount Dundee. The remains of the Government forces retreated to Dunkeld where by mid-August they totalled around 1,000 men, including reinforcements from the Cameronian Regiment who had marched from Doune near Stirling. At first light on 21 August 1689 they were attacked by 4,000 Jacobites. For sixteen hours the battle raged through the village from house to house. By 11pm the remaining Government forces, now confined to defensive positions around the Cathedral, were on the verge of defeat when the Jacobites withdrew. This was not the end of the first Jacobite uprising, but it was the beginning of the end of it. Only three houses in the village had not been destroyed in the fighting. Dunkeld did eventually gain a bridge linking it with Birnam on the far side of the River Tay. This was in 1809, when the ubiquitous Thomas Telford produced the solid seven arched structure that is still used today. 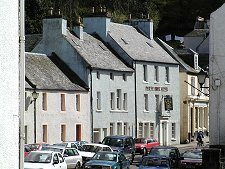 Today's Dunkeld is a lovely village of largely whitewashed shops, cottages and hotels. A great deal of work was done in the 1950s and 1960s by the National Trust for Scotland and the Local Authority to restore many of the older buildings in Cathedral Street and around the Cross. The results amply repay the effort. A highlight at the junction of Cathedral Street is the Ell House. This takes its name from the measure on its outside wall of the length of an "Ell", a length of 39 inches used as a reference for market trading. 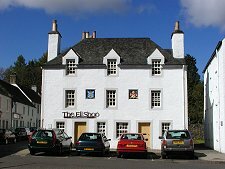 The Ell House is now the National Trust shop in Dunkeld. 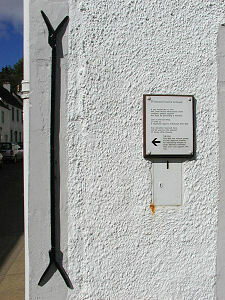 The nearby broadening of the road, known as The Cross, is home to the Atholl Memorial Fountain. 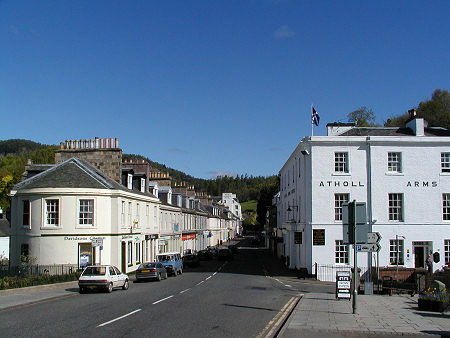 The main road, Bridge Street, extends from the bridge at one end through the built up area of the village, running in effect from the strikingly white and very comfortable Atholl Arms Hotel overlooking the bridge to the equally strikingly white Royal Dunkeld Hotel. This street is lined with a fascinating collection of shops, and about half way along it intersects High Street, leading to The Cross and the Cathedral beyond. 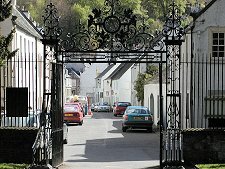 Immediately to the west of the village and the cathedral are the extensive grounds of the Hilton Dunkeld House Hotel.